The last part of the desert crossing started right on the beach – a 30km drive down the wet sand at low tide between the soft dry dunes and the soft wet sea…neither of which are particularly good for driving in. Even the wet sand was not so firm so deflated tyres and plenty of power were required – it would have been a nervous place to get stuck with the tide coming in! La Plage Blanche was, however, a pleasant way to start the 850km run down the Atlantic to Dakhla. The night before we set off was spent at the tourist camp named after the neighbouring ruined Fort Bou Jerif, down a rough track cutting a big chunk off the journey round by surfaced roads – a somewhat unlikely setting for a French-run luxury camp, complete with swimming pool of course! Dinner came with the usual issues – vegetarian was understood, but the vegetable soup starter appeared to be about 90% cream. 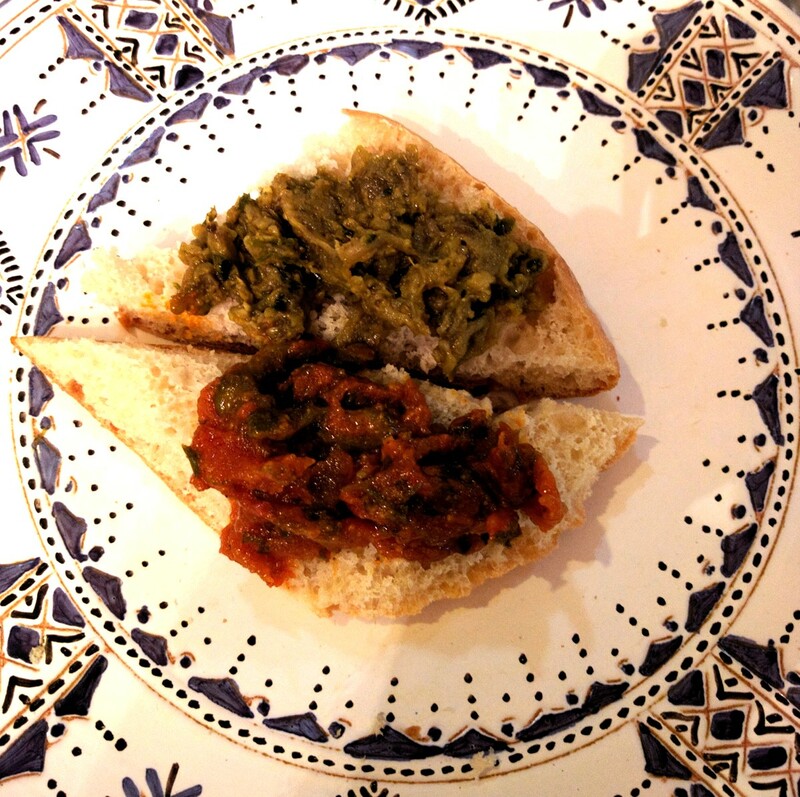 My alternative starter was actually much more tasty – Moroccan Ratatouille and Babaganoush with fresh bread. And so to the coast again – a group of Belgians in various overland vehicles had just come off the beach as we arrived, and they inflated their tyres as we deflated ours. We did then have their tracks to guide us as to the state of the sand, where they weren’t washed away by the waves. Even in this isolated stretch of sand, as we stopped to take photos, we found a high water line of plastic bits and pieces – occasionally incorporated into makeshift shelters in the dunes between the sea and the cliffs. The general setting was of course beautiful and wild and lots of open smooth sand…with occasional rivulets crossing which tried to launch Troopy into flight if taken unawares! 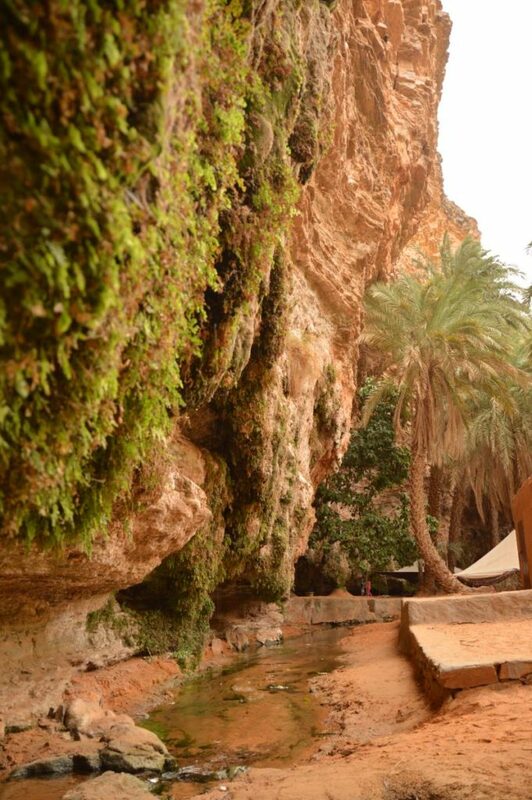 Once off the beach, it was a sandy, then rocky track inland frequented by camels until we met up with the main road. 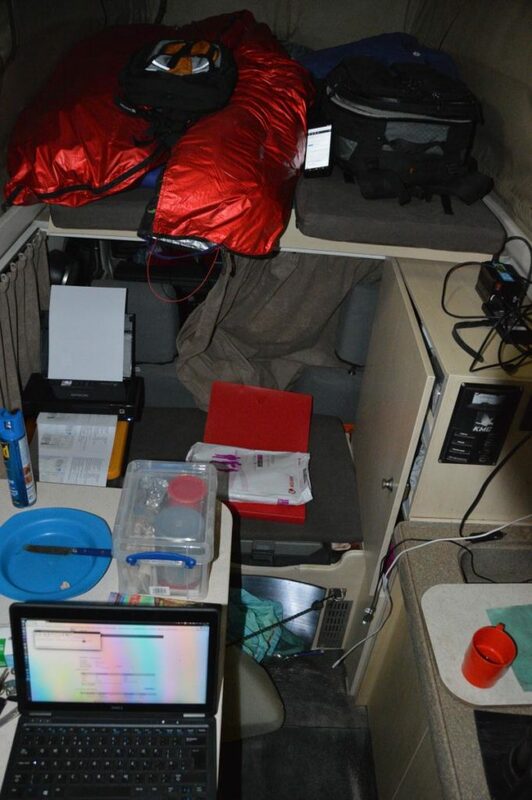 A night at a campsite by a salt lake, a morning paramotor flight, and another long day later we arrived at Dakhla, where for the first time since entering Morocco a police checkpoint asked for the car insurance certificate. Now, seeing as how the entry to Morocco was marred by a little scamming by unofficial ‘helpers’ in cahoots with the officials, who had extracted a payment to avoid causing trouble because the insurance office wasn’t open til Monday, this should have been a problem. In various towns I’d attempted to buy insurance, but this apparently simple and universal transaction was thus far pretty much impossible. I leafed through my stack of documents: UK insurance… Travel Insurance… Registration…etc… until the nice chap spotted a document with AXA on the top, which was in German. He was pleased with himself for recognizing it as German and studied it carefully before handing it back and saying OK, thats good, have a nice day. I’m very glad that AXA are not only the provider of Moroccan border insurance, but also Aviation insurance for my paramotor through an Austrian broker. The next day I went to both insurance offices in Dakhla to try again, and both told me it wasn’t them but the other one that does this. When I finally crossed the border into Mauritania and was issued with my Mauritanian insurance certificate, I couldn’t help but smile. 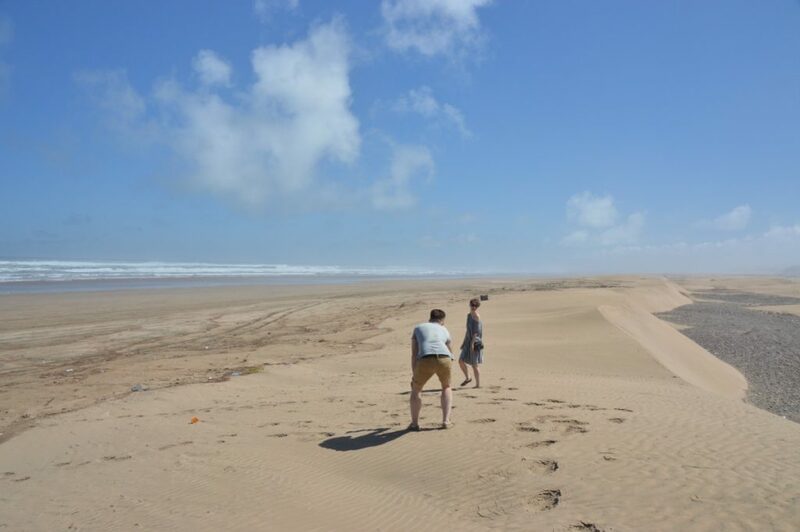 In Dakhla Yury and Maria said farewell and headed back home the (relatively) quick way, while I rested up by the lagoon and toyed with the idea of some kitesurfing. In the end I just watched them for a day before heading South again, making a pitstop at the last homely hotel before the border so as to arrive for the day’s entertainment first thing in the morning. This border has a degree of notoriety, but in all it just took me 5 and a half hours so get checked out of ‘Morocco’ and into Mauritania. Troopy was sent through the truck scanner before heading out into several kilometres of unpaved no-mans-land littered with abandoned vehicles, and I took the easy option of getting a local fixer to get me through the bureaucracy on the other side. This made for a fairly relaxing day, and I was all set up on the 1 remaining campsite in Nouadhibou as its only guest well before evening. Then to the desert again, in a 2-day off road adventure 400km to the East – after an initial section of tarmac and a couple of attempts to get through a maze of sand-drifted village alleyways, it was a case of keeping the railway line to my left and making my own way. Sometimes there was a clear piste, sometimes there were tracks going various directions, and sometimes it was just sand dunes and the increasingly scorching sun. In random villages a couple of times there were checkpoints to hand over the pre-printed ‘fiches’, but there was always the railway and its 2km long trains of iron ore. And goats. 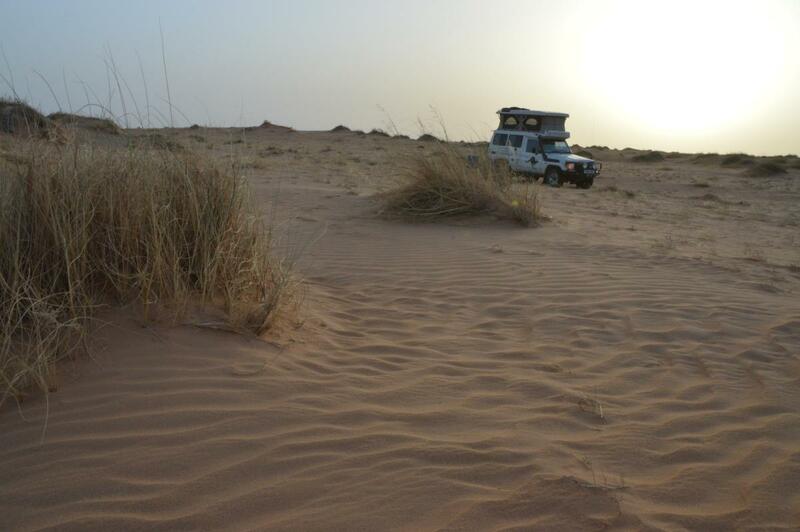 I camped out in the dunes about 2/3 of the way, away from my best guess as to where any ‘traffic’ might pass, and as night fell it was just me, supper of noodles, the wind and the distant sound of camels. Then about midnight some sort of vehicle came growling and clanking its way over the dunes near enough to see its headlights as they crested a peak, and I stopped feeling so relaxed. Meeting people out here in the middle of the night was not at the top of my list of things to try. I read my book on low light for a while and then went to sleep. The morning brought more fun sand dunes to drive over, and then the slow passing of the Ben Amira monolith – second largest in the world to Uluru. There were more opportunities for trainspotting before leaving the railway on a final 40km of compass bearing – driving across a gravel plain to join the piste from Choum to Atar. Atar is hot. Very hot at 42C+ for someone who has been in snow just a few weeks before, so there was not a lot of activity on day 1. Originally I had intended to visit Guelb ar Richat – The Eye of the Sahara – a strange geological formation that looks like a giant crater from Space. However, a combination of fatigue with desert pistes and the security situation portrayed by the UK Government Travel Advice pages had me reconsider. It is apparently nothing special up close in any case – hard to make out the overall structure of a 40km wide feature from ground level! Fortunately, an alternative showed up in the form of a German backpacker and a local guide. Clemens, Alioune and I instead spent a morning discussing Mauritania and drinking tea at a friend’s house, and then a day visiting Chinguitti and Terjit, via some rock paintings featuring long lost African wildlife. 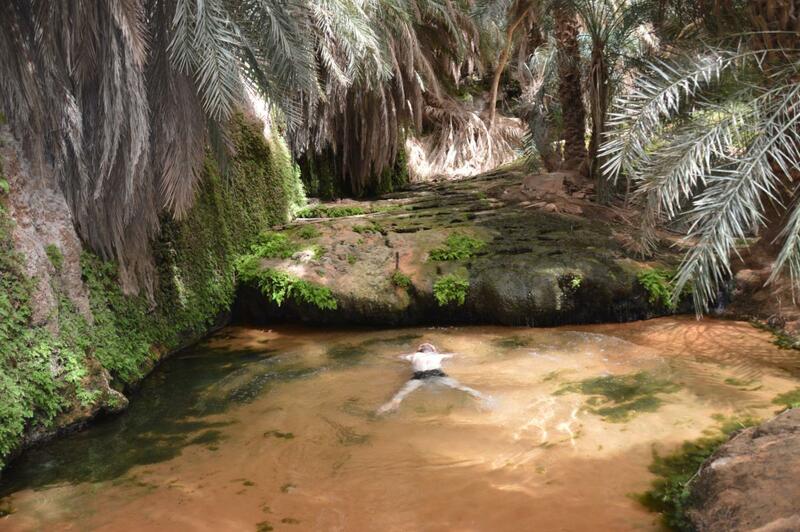 After the rock, sand and heat of the day, throwing ourselves into the cool water of the Terjit Oasis was beautiful to all senses…though Alioune’s taste for unripe dates was not contagious! Terjit – You have no idea how nice this was! Anyone who is thinking of visiting this region should contact Alioune (+222 22 25 88 54) – he’s a great source of knowledge, speaks very good English and seems to know everyone within 100 miles! And finally…a surfaced road all day across a flat, featureless plain in the centre of a complete circle of shimmering heat haze brought me to Nouakchott. 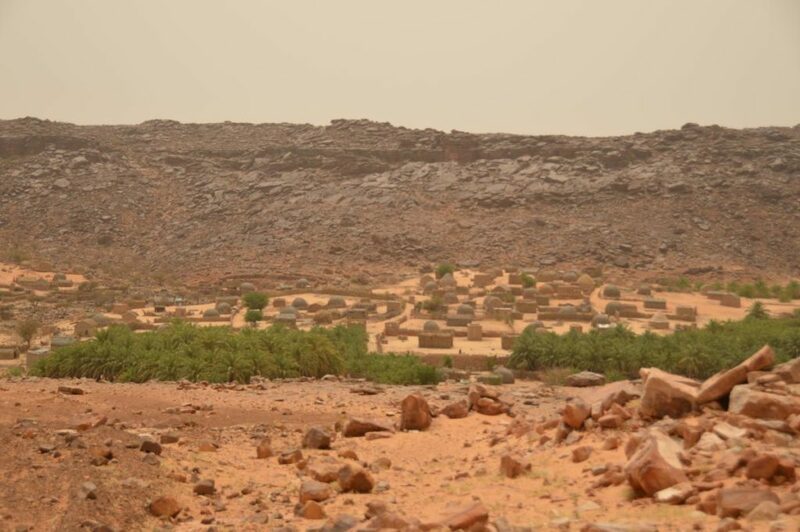 The capital and home to most of Mauritania’s people is a busy and growing city with lots of colour and life, as well as being close enough to the edge of the desert that fruit and vegetables are easily available…along with falafel and ful. Almost back to a landscape capable of supporting its population! 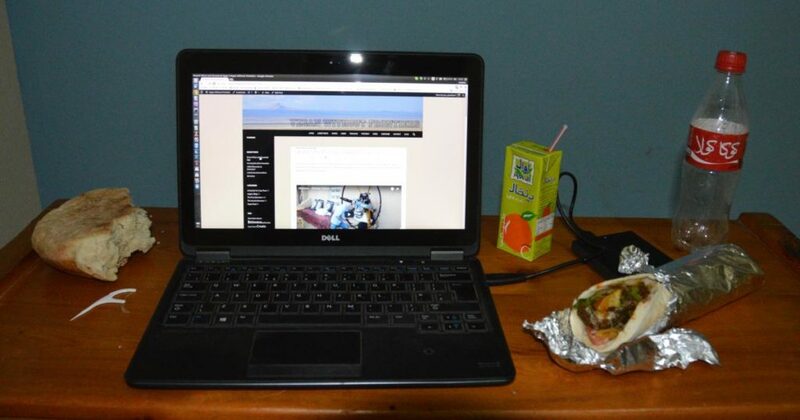 Although in Nouakchott, I had a desk and ‘restaurant’ food!